Here is a list of Best Free File Recovery Software for Windows. All these software can help you recover back deleted files from your computer. If you have lost some important files accidentally or due to some other reasons and you want them back, these software can help you recover deleted files. It is a possibility that deleted files remain intact somewhere in disc even after deletion. These files can be recovered from disc with the mentioned file recovery software. File recovery software are mainly used to recover deleted images, videos, documents, music, exe, and other files. These software can resolve data loss problems. If you accidentally delete any data then you can restore the data using any of these software. These recovery file software can also help to recover data deleted due to viruses, malware elements, bugs, system format, and system crashes. These software not only recover files from internal hard drive, but also external hard drive, memory card, USB drive, CD, DVD, mobile phone, digital camera, memory card, and other storage devices. It can also recover a file when recycle bin has been emptied. So, if you want to get back your lost data, go through this article and find out how to get back lost files using these file recovery software. You can use any of the mentioned software to recover lost files. 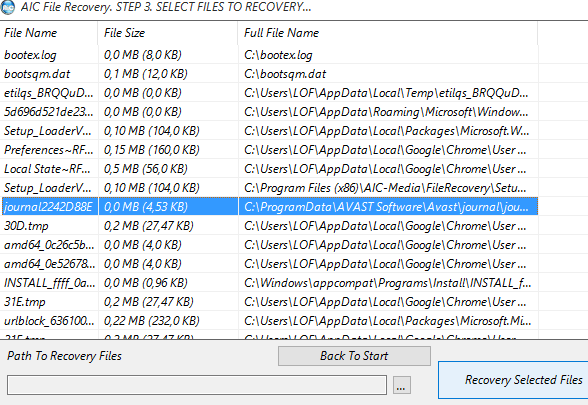 Recovering a deleted file involves only few steps. My favorite software to recover deleted files is Orion File Recovery System. You can recover lost images, music, videos, and other files. It can scan hard drive, external hard drive, pen drive, flash memory, memory card, and other storage devices to find deleted files. It lets you run simple scan or deep scan to get all deleted files from a device or drive. It can also be used to wipes off data from systems to permanently delete a file. You can also check out the list of Best Free Photo Recovery Software For Windows, Best Free Video Repair Software For Windows, and Best Free Jigsaw Puzzle Maker For Windows. 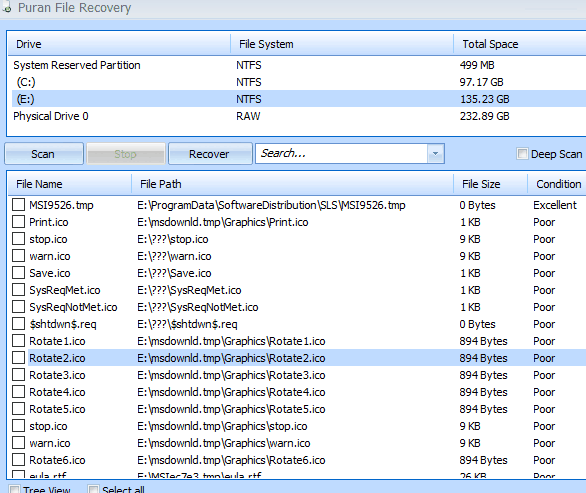 Orion File Recovery System is a freeware to recover lost files. It searches for all deleted files from a PC, hard drive, pen drive, any external portable devices. You can choose any specific data types or file name to recover documents, music, photos, etc. You can also search for all deleted files types and names, which can be recovered. Here two types of scans can be run. One is simple scan and other one is deep scan. 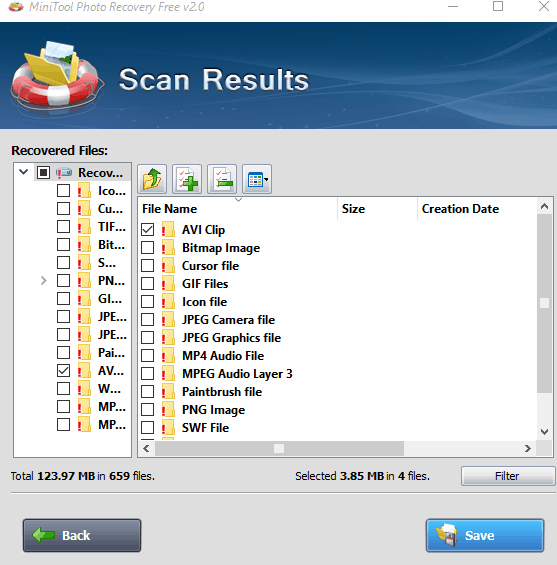 If simple scan cannot find the file you are looking for, then run Deep scan. It will provide you the complete list of deleted files which are possible to recover. It scans your documents, recycle bin, folders, or a drive. You have to save the scanned file in a drive for complete restoration of files one by one. It is not only used to recover deleted files but can also be used to delete a file permanently. It wipes hard drives, memory cards, flash drives, and other storage devices to completely erase files. Supported Windows Versions are: Windows 10, Windows 8, Windows 7, Windows Vista, and Windows XP. Pandora Recovery is another free file recovery tool. it can recover all deleted files including the files deleted from recycle bin. All you have to do is, select a drive and run a scan to find all deleted files. Browse: It lets you run a scan to browse all files which are deleted from a selected drive. It gives you a list of all the deleted files that are recoverable. Search: It searches a specific type of file to recover from the selected drive. Surface (Deep) Scan: Here you can select a specific file type and scan to search deleted files from the selected drive. It displays properties of recoverable files, like: file types, size, disk drive, starting cluster, etc. You can also preview a selected image file. 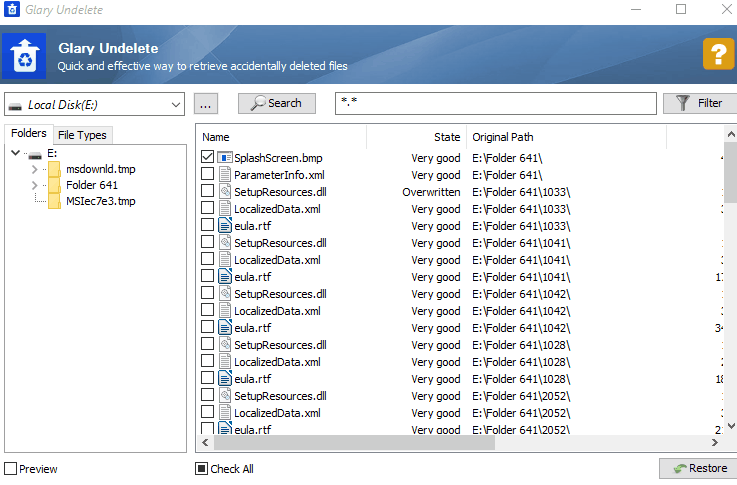 Save selected deleted files to a destination folder to recover them. Windows compatible Versions are: Windows 10, Windows 8, Windows 7, Windows 2000, Windows 2003, Windows XP, and Windows Vista. 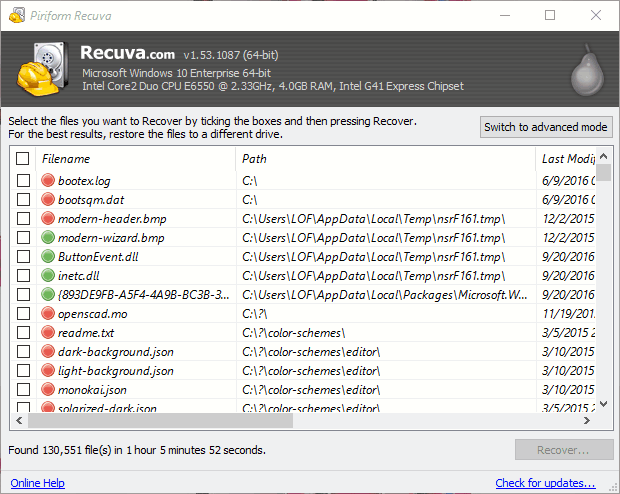 Recuva is a freeware to restore deleted files from system. It lets you search deleted files from a specific location. You can customize a scan by selecting file types and location. It can recover images, music, documents, videos, etc. You can also recover files from iPods, media cards, recycle bin, my documents, etc. If you are not sure about the location of deleted files, then there’s an “I am not sure” option. It runs two types of scan: Simple Scan and Deep Scan. Simple Scan takes less time to search deleted files and may not search all deleted files. On the other hand, Deep Scan takes more time to complete a search for deleted files and displays all possible recoverable deleted files. It has an advanced interface, which lets you view recoverable files with other features. Here you can scan a drive based on file types. You can also preview image files and view information attached with a deleted file. Recover files that you want to, by saving them in a destination folder. Try to save it in different destination drive as saving in same drive will reduce the chance to recover. It works on various Windows versions: Windows 10, Windows 8, Windows 7, Windows Vista, and Windows XP. Wise Data Recovery is a free data recovery tool. You have to choose a drive from where you want to scan deleted files. You can also run a scan for specific file types. Scanning will give you a list of deleted and recoverable files. It also lets you know the possibility of data recovery. It will put a color mark at the start of a file name which indicates its possibility to recover. Green color indicates that it will completely recover, yellow color indicates partial recovery, and red color indicates that its almost impossible to recover. You can save all searched files or selected files to a destination folder to recover them. You have to save these deleted data to a drive other than parent drive to recover them properly. Undelete 360 is a freeware used for hard drive recovery. Here, you can scan drives from where you want to recover deleted files. Scanning will provide you a list of all recoverable deleted files and then you can save the selected files to a destination folder. It is recommended that you should save these files to different drive from parent drive to restore them. Not doing so will overwrite the file and you will get some erroneous data. It works on the following Windows versions: Windows 10, Windows 8, Windows 7, Windows XP, and Windows Vista. Note: All features are not enabled in the free version, to unlock them you have to purchase this recovery tool. For example, you cannot wipe data to erase it permanently in the free version. Glary Undelete is a free data recovery tool. It can recover files from local drives, folders, memory cards, pen drives, flash memory, and other storage devices. You can also apply filter to recover files according to file size, file type, file name, date, and state. It will search all deleted files from the selected drives, based on applied filter. You can preview recoverable files, which will help you select the required files to restore. It supports various file system, such as NTFS, NTFS+EFS, and FAT. It can also recover fragmented, encrypted, and compressed files. You can get the data back which was deleted by viruses, bugs, and crashes. Free Undelete is one of the free file recovery tools. It will help you to recover files you may have lost or deleted unintentionally. It scans drives and lists all deleted files which can be recovered. You can also apply filter based on file name and folder name. You have to save the selected files to a destination folder to restore them. You should restore files in drives different from the drive you scanned to recover files. You can run it on the following Windows versions: Windows 10, Windows 8, Windows 7, Windows XP, and Windows Vista. MiniTool Photo Recovery is a free photo recovery tool. It can recover files from camera, memory card, internal hard drive, and other storage devices. It helps you recover picture, graphics, audios, and videos. You just have to scan a drive or a storage device to view a list of all deleted files. Simply save the selected files to a folder or storage device to recover them. It lets you apply filter and preview selected files, so that you can easily find out the files you are looking for. You must save the selected files on a different drive or device from the parent drive to get best result. It is a multi platform file recovery tool, available for Windows and Mac. It works on various Windows versions: Windows 10, Windows 8, Windows 7, Windows XP, and Windows Vista. Partition Guru is a freeware to get data back. It helps you find and recover deleted files from hard drive, USB flash drive, SSD, RAID, virtual disk, memory card, and other external storage devices. It searches and recovers deleted, missing, or formatted files. It scans drives and provides you a list of all deleted files than can be restored. Search and find out those files which you want to recover. Save these files to a destination folder to restore them back. It is complete suite for Data Recovery, Windows Backup & Restore, and Partition Management. 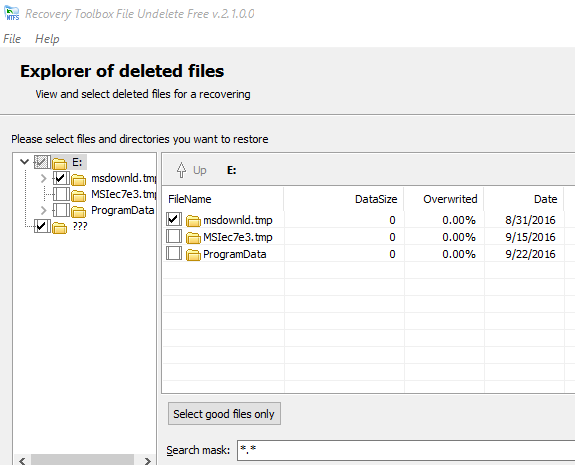 FreeRecover is a simple freeware to recover multiple deleted files. It scans a selected drive to find all deleted files. You can view a list of all deleted files along with details, like: file path, file size, etc. It lets you preview a deleted file to help you find your lost file easily. Selected files scan be saved to a destination folder to recover them. It supports NTFS file system only for recovery. Kickass Undelete is a free and simple recovery data tool. It can find recoverable files which were deleted accidentally from hard drive, memory card, flash card, and other storage devices. It lets you select a drive to scan for all deleted files. A list of all deleted files will be created after scanning. You just have to find those files from this list to recover and save them to a destination folder. It supports FAT and NTFS file system. EaseUS Deleted File Recovery is one of the best data recovery tools. It helps you scan, search, and save deleted files. You will find a list of deleted files of a specific drive. If you are not able to find a specific file to recover from the list of deleted files, then you can search it by applying filter. You can save all deleted files or selected files. It also displays total size of selected files. It works on Windows 10, Windows 8, Windows 7, Windows Vista, and Windows XP. AIC File Recovery is another good freeware to recover deleted files. It lets you search deleted files from a selected drive. You can search for all deleted files or some specific files. It lets you limit searches by applying filter. You can search individually for music, images, videos, documents, etc. Files of a specific extension can also be searched here. You can limit searches by applying size limit as well. It lets you search with exact file size, smaller than a files size, or greater than a file size. Scanning will list all deleted files and then you have to save selected files in a destination drive. 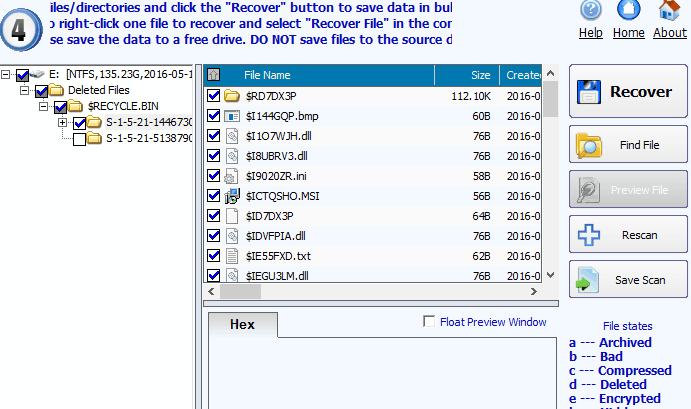 Recovery Toolbox File Undelete Free is a freeware to search and save deleted files. It lets you restore your deleted files in 3 steps only. Scanning a drive displays a list of deleted files from that drives. Selected, all, or good files can be restore to a destination drive and folder. 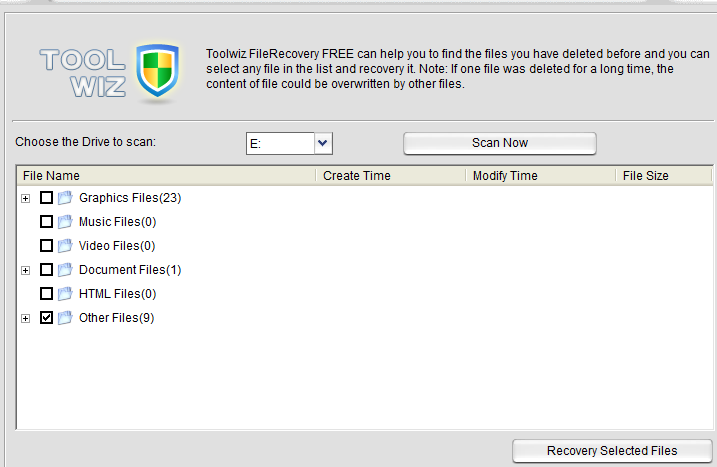 Toolwiz File Recovery is a free and simple recovery tool. You can select a folder to scan to find all deleted files from them. It will search and list all deleted files. You just have to choose the files to save them in a destination folder. It can find and restore even those files which were deleted due to viruses, hardware failure, malicious elements, and operating system crashes. Lazesoft Data Recovery is a free software to recover file system. It lets you run scan for all deleted files for a specific location. A list of all deleted files will be enlisted to recover after the scan. Select files which you want to restore and save them in a destination folder. If you have a long list it gets difficult to find certain files to recover. In this case, you can apply filter based on file size, modified date, state, etc. It also displays preview of images, so you can select them by their preview as well. This file recovery program can search for accidentally deleted files from hard drive, formatted partition, emptied recycle bin, crashed disk, etc. It helps you recover those file which are deleted due to system failure, virus, unexpectedly shutdown, etc. It is highly recommended to not to save files to the same drive from where the files are deleted. It is due to the fact that it will give erroneous result and corrupt files will be stored. 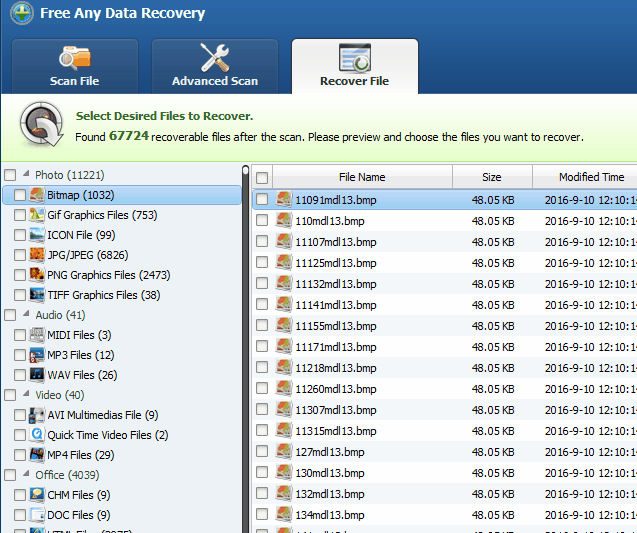 Free File Recovery is another freeware to recover those files which were accidentally deleted from your PC. It can recover deleted files from recycle bin, memory cards, mp3 players, floppy disks, etc. If files were deleted because of viruses, malware, bugs, crashes, etc., then it will help you to get them back. You can scan and search a list of all files deleted from a hard drive. It lets you customize scan, so you can run a scan for specific file type. Restore selected files to a destination folder after scan. Make sure that destination folder is not the same hard drive. This file recovery software can recover various files, such as music files, videos, documents, emails, etc. It supports NTFS5, NTFS+EFS, NTFS, FAT32, FAT16, and FAT12 file systems. Puran File Recovery is a simple freeware to restore deleted files from a hard drive, memory card, pen drive, CD, DVD, and other storage devices. It scans a drive to recover deleted files from it. It lets you recover various file types, such as: photos, videos, music, documents, etc. Scanning process provides you a list of deleted files. If you want to scan certain folder or file types then you can run a customized scan. If you have no idea about file types and location then run a deep scan to find out all deleted files from a specified location. You have to pick files from the list which you want to recover. Save them in a destination folder to restore. You can preview a file before recovery; it will help you find exact files you are looking for. DiskGetor is a freeware to recover deleted files from a drive. It helps you to recover formatted, deleted, damaged, and lost files from a hard drive. You can also recover deleted files from external storage devices, like: pen drive, memory card, etc. It supports photos, videos, documents, music, zip files, and many other types of files to recover. 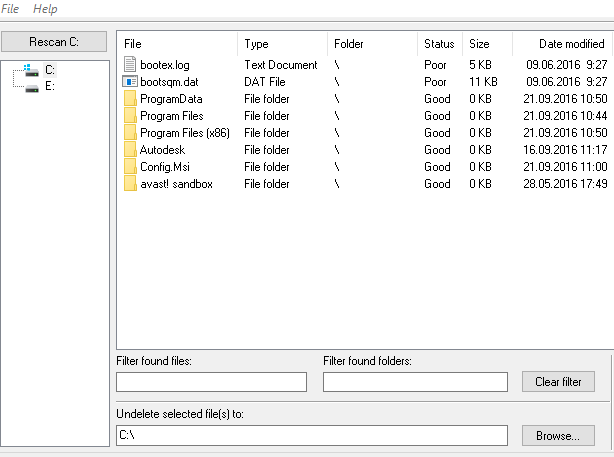 Scanning a drive displays a list of deleted files with folders. You can view their size, path, and state. State are described by letters A, B, C, D, F, G, H, R, and S, which represent Archived, Bad,Compressed, Deleted, Encrypted, Hidden, Read only, and System respectively. Save a single file or save files in bulk in a destination folder. You can find a file by its name or extension from the list to save. You should save data to any other drive instead of source drive, otherwise files will not be recovered properly. 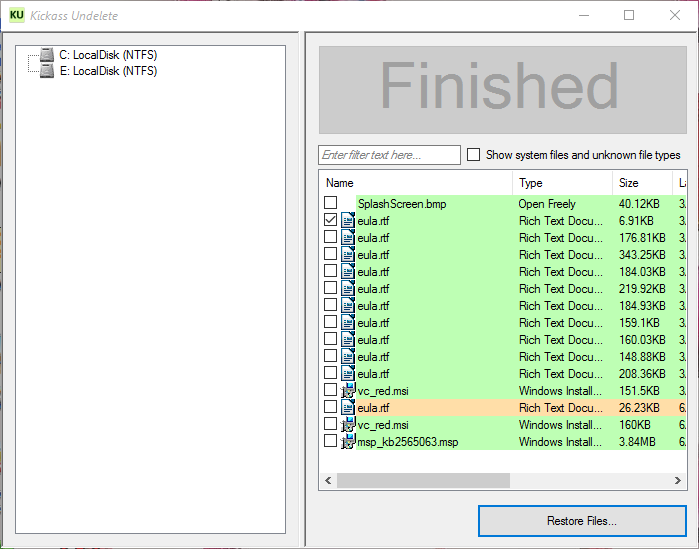 DataNumen NTFS Undelete is a freeware to recover deleted files from drives. You can simply scan a drive from which you want to find deleted files. Scanning will give a list of deleted files from that drive. It scans recycle bin and the folder which are recoverable. You can run a scan for a specific file type. To restore a file, you have to find, select, and save the files to a destination folder. It works on Windows 10, Windows 8, Windows 7, Windows XP, Windows Vista, Windows ME, Windows NT, Windows 95, and Windows 98.